Ontario’s environment ministry has released proposed siting guidelines for offshore wind turbines that set a minimum distance of 5km (3.1 miles) from shore. The rules, which are now open for public comment, will be subject to public hearings in the fall. Ontario does not have ocean frontage; the rules are meant to govern wind farms planned for the Great Lakes. The proposed standard would undermine some proposed wind farms, which are aiming to be 2-4km from shore. It is likely that the proposal would greatly minimize the visual impact of turbines, and would may also reduce sound impacts to an acceptable level. As noted in this brief essay, sound travels very easily over water, so that typical onshore setbacks could be insufficient for offshore sites. Some reports from near the Wolfe Island wind farm (at the end of Lake Ontario, near the start of the St. Lawrence Seaway) suggest they are often quite audible from two miles, and occasionally somewhat audible at five to seven miles. While there is often an assumption that wave sounds will easily drown out distant turbines, it’s likely that people living somewhat inland from the shoreline in otherwise very quiet rural areas would be the most affected by offshore turbine sounds. One of the more promising green energy technologies is wave power: off every coastline, near urban centers, a steady surge of waves holds the promise of round-the-clock power generation. As ever, though, there are possible environmental impacts; one of the main ones for wave energy is the possibility of collisions with migrating whales. Large baleen whales (gray, humpback, fin, blue) don’t use echolocation to forage, so are unlikely to notice offshore installations from a distance. They are, however, careful listeners, and so Oregon State University researcher Bruce Mate is preparing to test a noise-making system that he hopes will hit the Goldilocks spot for migrating Gray whales: loud and un-natural enough to get there attention, but not so loud that it will cause widespread impacts. “We do not even expect gray whales to react to the sound unless they are within 500 to 750 meters of the mooring location,” Mate said. “We’re not talking about much sound here.” Mate said the acoustic device would emit one-eighth of one watt, which they hope will make the whales alter their paths about 500 meters from the noise. The system will be tested this fall, during the migration of single male Gray whales, and be suspended before mother-calf pairs begin their transit of the Oregon coast. Ocean Power Technologies aims to deploy 12 wave power units 2.5 miles off Reedsport, Oregon, by 2012. While whales may adapt fine to the new structures, the risk of a collision is considered to be something that could set back offshore renewable energy development for years. The current research could inform future protective measures, should regulators or industry decide that they are necessary. For more, see this OSU press release, this good overview article in Forbes, and this post on the Smart Planet blog. Litchfield NY is considering a relatively flexible, while stringent, local ordinance to govern construction of wind farms. As proposed by a committee of residents charged by the Town Council, the ordinance would avoid strict setback or decibel limits, and instead require easements to be obtained from all residents within 6500 feet of a turbine (just under a mile and a quarter). The proposed ordinance now goes to the Council for consideration, where some changes are expected to be made. Involving all neighbors who may be affected by new wind turbines could be a very effective approach, as both studies and experience shows that when people are involved in the decision to move forward with a wind farm (and compensated financially, or feel shared ownership), they are far less likely to have negative reactions and experiences. I’m sure that the distance at which easements are required will be a sticking point for all concerned; as proposed, it encompasses a large grey area (from roughly 3500-6500 feet) in which acoustic effects are likely to be minimal, yet possible a small proportion of the time. If the easements don’t effectively become vetoes, it’s quite likely that being involved in the decision could play a key role in this range. Closer than a half mile or so, the proposed easements may well be sometimes used as a veto, as at least a few residents are apt to feel that the risk of noise issues is not outweighed by financial benefits in the project. Still, the easement approach has many benefits over a strict decibel or setback limit, assuring that the developer is engaged with everyone who may be affected by the project. 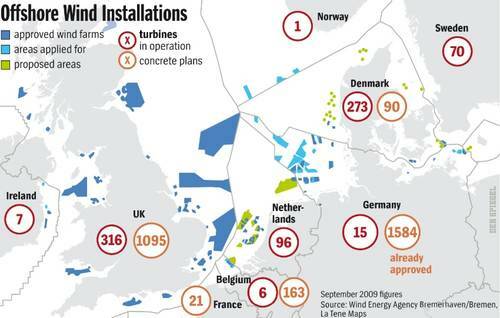 An article in Der Spiegel reveals that the environmental impact study at a 12-turbine wind farm 30km off the coast of Germany has reported that during construction of the turbines, porpoises avoided an area in a 20-mile radius of the two-square mile construction site. Harbor porpoises are well known to be more sensitive to sound than many ocean creatures, and may serve as a sort of “canary in the construction zone,” their stark behavioral response standing as an indicator of noise levels that likely interfere with other animals, as well. This one passed under my radar in January, but has some potentially interesting implications for people working to minimize the negative effects of wind farms on wildlife and humans, in that the developer agreed to shut turbines down at night, at least temporarily. In December, a Federal court halted construction of the Beech Ridge wind farm in West Virginia, because Indiana Bats, officially listed Endangered Species, live nearby, and the developers had not obtained the necessary Incidental Take Permits that govern activities that may impact such species. In a settlement announced in January, Beech Ridge Energy, a subsidiary of Invenergy, agreed to forego construction of 24 turbines closest to the bat caves, while receiving approval to operate the 40 turbines that are already constructed, to complete construction of 27 more, and to move forward on planning for an additional 33 units (though the units not yet constructed may not begin operating until the ITP is received). Most strikingly, the company agreed that all operational turbines will be shut down at night from April to November 15, when the bats are out and about. During the hibernation season, from mid-November through March, the turbines can operate around the clock. Future operating conditions, including the need for night-time curtailments, will be subject to the determination of the US Fish and Wildlife Service Incidental Take Permits. Noise is not the issue here, but rather bat mortality near wind turbines, likely caused by rapid changes in air pressure. It is encouraging to see the viability of operational restrictions being experimented with, and accepted by both industry and environmental groups as a way forward through a contentious issue. Indiana Bats are not known to travel in the area of the wind farm, though the proximity of their caves suggests they may; monitoring done by the company was challenged in the lawsuit as insufficient. Ongoing acoustic surveys will help clarify how common they are, and the USFWS may decide that night time restrictions are unnecessary. As part of this settlement, the company agreed not to appeal the judge’s decision, and the environmental plaintiffs agreed not to appeal the eventual ITP decision by USFWS. Happy talk all around after the agreement: Dave Burhman, spokesman for MCRE, said, “We believe our actions have sent a vitally needed message to the wind industry as a whole. Renewable energy projects do not get a pass on existing laws designed to protect endangered species and the natural environment. And although industrial wind turbines will now spin atop some of Greenbrier County’s highest ridges, they will forever be banned on those ridges in closest proximity to endangered Indiana bat caves.” And Joe Condo, general counsel for the company, agreed that “We are very pleased to have reached an agreement that allows us to move forward with creating clean, renewable energy in Greenbrier County while at the same time meeting the goals of important wildlife conservation efforts. As noted in a previous post, a recent report by the Chief Medical Officer of Health (CMOH) in Ontario focused on the narrow question of whether there is a “direct causal link between wind turbine noise and adverse health effects” experienced by some wind farm neighbors. Based on a review of published research, the answer was, “no.” This week, two of the people who were on the review committee providing feedback on the report as it moved from draft to final form noted that the final version dropped a section that some reviewers had urged be included, which would have more directly addressed the actual experiences of communities near wind farms. Both Lynn and Copes stressed that they agreed with the report as far as it went, and that direct noise levels and sound qualities of wind farms don’t appear likely to directly cause health problems. Lynn noted that there is an “association” between wind farms and some health effects, but that these effects also occur elsewhere; still, she said, “Basically, I think they (wind farms) disrupt communities if they’re not properly planned and instituted and when you disrupt people’s communities they get sick.” There is evidence to back that position up, she added, but “that doesn’t come through very clearly” in King’s report. Likewise, Copes stressed that the idea of a unique quality in wind farm noise causing a new set of health problems seems “implausible,” yet he also stressed (as did AEI) that the report highlights the need for more direct measurements of sound levels around wind farms. Such measurements will add much-needed ground truthing to the sound models currently used in siting decisions, and could provide more concrete data to use in assessing both noise complaints and health concerns.